Paragon Scientific has UKAS accreditation. Make sure your organisation gets it right, first time every time. The United Kingdom Accreditation Service is the sole body recognised by Government for the accreditation of conformity assessment against internationally agreed standards for testing, calibration, inspection and certification. Our Certified Reference Materials ensures good inter-laboratory correlation. Fully Traceable to National Standards. For routine calibration of colour measuring instruments, verification of test data and ensuring good inter-laboratory correlation. Our Density Standards are ideal for routine calibration of colour measuring instruments, verification of test data and ensuring good inter-laboratory. 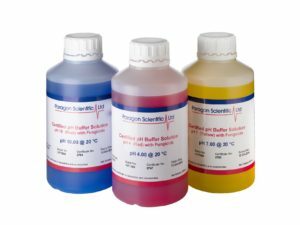 Paragon Scientific produces a range of sucrose standards for use in the calibration and verification of all types of refractometer. Manufactured to ASTM D 664 / IP177, tested and certified at Paragon Scientific’s ISO 17025 accredited laboratories. Manufactured to ASTM D 2896 / IP276, tested and certified at Paragon Scientific’s ISO 17025 accredited laboratories. Paragon Scientific Limited specialises in the production of Premium Quality, Primary level, Viscosity Reference standards. Standards for the calibration and verification of analytical equipment used in Cold Cranking Simulator testing to ASTM D5293. The standards are especially designed for the paint and coatings industry. Dual UKAS certified to BS EN ISO / IEC 17025 and ISO Guide 34. Flow Cup viscosity standards are especially designed for use in DIN, Ford, ISO, Shell and Zahn flow cups and are also dual purpose Density standards. Manufactured in accordance with ASTM D 2162, the primary method for viscosity standards manufacture. Dual certified to both ISO 17025 and ISO Guide 34. These high temperature standards are tested at 135°C and 150°C, and ensure full compliance to ASTM & IP test method protocol. These standards are widely used for the verification of viscometers at sub zero temperatures. Dual UKAS certified to BS EN ISO / IEC 17025 and ISO Guide 34. Manufactured in accordance with ASTM D 2162, the primary method for viscosity standards. Certified to International Standards BS EN ISO / IEC 17025. These viscosity standards are specifically designed for Rotational Viscometers. Dual certified to ISO 17025 and ISO Guide 34. To determine kinematic viscosity according to ASTM D 445, ISO 3104, IP 71, and BS188. Instruments used to measure the specific gravity (or relative density) of liquids. Glassware for ASTM D86 Distillation of Petroleum Products at Atmospheric Pressure. Glassware for D1160 Distillation of Petroleum Products at Reduced Pressure. ASTM D1319 Standard Test Method for Hydrocarbon Types in Liquid Petroleum. Glassware for ASTM D97 Pour Point of Petroleum Products. Glassware for the test method ASTM D2500 Cloud Point of Petroleum Products. Glassware for ASTM D524 Ramsbottom Carbon Residue of Petroleum Products. Equipment used to indicate the ability of steam turbine oils to prevent rusting of ferrous components. Colour measurement equipment used to determine the colour scale of pertroluem oils and wax. Manual and automatic flash point analysers to determine the flash point of materials. H2S in liquids analyzer and AvCount particle counter from Seta Analytics. Rotational Viscometers to measure the viscosity of liquids in accordance with international standards. Viscometer and calibration baths specially designed for tests that require ultra-precise temperature control. Hand-held, digital and Abbe refractometers for the measurement of an index of refraction (refractometry). We are able to offer a calibration service for Flow Cups. This service includes cleaning and full recalibration of Flow Cup. We are able to offer a calibration service for Hydrometers. Available with UKAS ISO 17025 certificate of calibration. We are able to offer a calibration service for Thermometer. Available with UKAS ISO 17025 certificate of calibration.